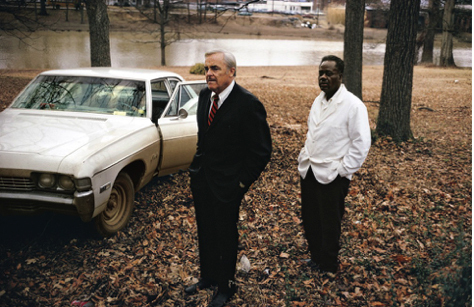 A new exhibition at the National Portrait gallery celebrates the work of William Eggleston. Known by many as the ‘Godfather of Colour Photography’ his work is both insightful and fun. That said, it is the film he used that steals the show. Though not the saccharine portrayal that an ad company might come up with to sell the american dream, his work certainly seems celebratory of modernity and the context of America is unmistakable. He shows us popular culture at the time, not through it’s superstars or rock n roll sensations, but once it has filtered down to the very real, and much more humble masses of the deep south. Many of his photographs taken in the mid-seventies of the general public show slightly out-dated fashions that would be more classically associated with the 1960s and even late ‘50s. This just emphasises the concept that Eggleston was shooting real people with real lives in an age when fashion and culture was not a high turn over industry founded instant gratification. Though what really draws people to Eggleston’s work is the beauty he finds (or creates) in the banal day-to-day existence of his subjects, it does also hold a multi-dimensional aspect if viewed through the filter of class commentary. Though this does seem rather an unconscious element and perhaps one more relevant in hindsight. Predominantly, his work is an aesthetically enthralling ode to the colourful era in which he and his subjects inhabit. While looking at Eggleston’s work it is hard to ignore an overwhelming sense of worship to the work pre-Raphaelite brotherhood and their followers, particularly when examining the portraits he creates of the women he knows. While some are a slight doth of the cap to the era, others seem to be a tribute to actual paintings. His photograph Untitled 1974 which features Karen Chatham and the artist’s cousin, Lesa Aldridge is highly reminiscent of Wallis’ ‘Chatterton’. The electric blue folds in the material on her dress, the auburn tones in Chatham’s hair, the light source positioned in so as it implies a sort of other worldly, divinity (though significantly more divine in Wallis’ painting, Eggleston does at least position the source of the fluorescent glow in the same place). 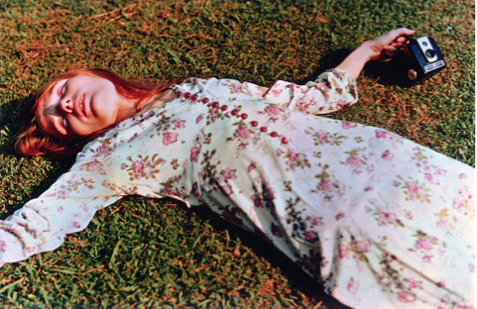 Similarly in Eggleston’s portrait of Marcia Hare taken in 1975, he floral dress, long flowing hair, open mouth and tilted, gaunt face bares a striking resemblance to the composition and palette of Millais’ ‘Ophelia’. Eggleston’s visual ethos does not always fits with the code of the pre-Raphaelite brotherhood, though it could be said that one of their doctrines was followed by Eggleston, only in a very contemporary sense; ‘to study nature attentively, so as to know how to express them’. Though Eggleston’s nature was a very different one to the likes of Millais et al, his keen observation and ability to focus in and magnify a fleeting, human moment gives his work an unusual majesty that will no doubt lead to his work being studied by art and photography students for centuries to come. William Eggleston Portraits will run until 23 October 2016 at London’s National Portrait Gallery.